The Hia Community Library Project has made a slow but considerable progress. Since its inception in December 2007, the local Library committee members and have worked tirelessly with UK partners and Funders in ensuring that the project is completed amidst challenges. Since the last update posted in 2009, a base line study conducted in 2009 on Access to books and the Reading Habits of Primary and Junior High School children in the only government school at Hia, has been analysed. A sample of 35 pupils was selected at random from primary 4, 5, 6, Junior High 1, 2 and 3. About 60% of the children have no access to reading books. The 40% who had access to any reading material had access only to school textbooks. The identified textbooks are Science, English, Religious and Moral Studies, Citizenship Education and Twi. Other reading material was handwritten notes taken by the children at school. About 75% read at home and at school. About 20% read only at school. About 75% read because of school work. About 18% read for school work and leisure. About 6.5% read for leisure. The average duration of reading for a pupil, apart from school hours, was less than one hour a week. Only one pupil has ever used a library in their life time. All liked the idea of having a library in their community and look forward to using it to enhance their learning. Resources preferred are subject specific textbooks. Dictionaries, computers, fan. TV, pens, story books and notebooks. In line with the objectives of the library project, a similar study will be conducted six months after the library has been operational to assess any impact made. 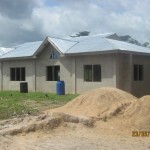 In February 2010, Ghana Nurses’ Association UK, donated £1000 to support the building works to reach the lintel level. I made a visit to Hia in June 2010. The library project committee had very worked hard in keeping up the motivation level of volunteer builders from the community. The library building was at its roofing stage as depicted in the enclosed photos. The roofing works required expert input in terms of quality and durability. The next challenge was to raise £1000 for the cost of roofing works (roofing materials having been provided by Ghana International Bank Foundation). 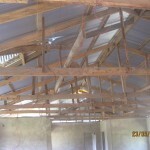 In July 2010, Ghana School Aid UK kindly donated £1000 for the roofing workmanship. St Cecelia’s Catholic Primary Scool in Sutton continue to donate books for the project. We would like to say a big THANK YOU to GSA UK for their continued support and to St. Cecelia’s Catholic school in Sutton who have and continue to donate books to equip the library when it opens and also for expressing keen interest to develop and maintain a school link with Hia Primary school. In Septembe, Rita De-Graft visited Hia to asses the progress of the project. This was followed by a visit by the Vice Chairperson (Mrs. Agatha Kramo) and a member (Mrs. Connie Frimpong) of GNA-UK. 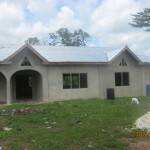 The libary building had been plastered and roofed but still needed some finishing touches as depicted in the enclosed photos. 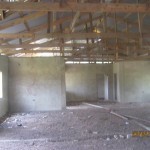 Ghana International Bank Foundation donated GHS 4,500 to complete the roofing works, flooring, painting, doors and windows. The next and final phase of completing the building works will be fitting the shelves, providing tables, chairs and stocking the library with books and other learning resources. Donations in cash and kind are welcomed. Please contact info@gna-uk.org. 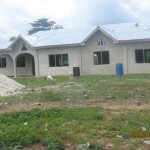 It is expected that the library will be officially opened by the end of 2012.